Modular offices often are used as control rooms in production facilities to minimize noise and other disruptions that result from the manufacturing process. Not only do these offices provide reliable sound and environmental control for workers and sensitive equipment, they can also be tailored to fit nearly any space. Available in a variety of finishes and material options, modular offices are suitable for virtually any work environment, no matter how harsh the conditions. Modular control rooms range from small to sizable, and can even be built atop factory floors to house supervisors. Assembly is typically seamless, which will be discussed below in further detail. Thanks to their great versatility, modular spaces can be used in all types of settings, including those outside of the industrial sphere. Modular buildings are utilized in skyscrapers, apartments, and dormitories, and as housing for the homeless or those affected by natural disasters. These modular units may also serve as call centers, police bases, and recording facilities. Installing a modular control room, in particular, offers a number of unique benefits. First, modular buildings eliminate the need for costly, time-consuming renovations. And, thanks to the great flexibility offered by modular construction, if a control room needs to be expanded, renovated, relocated, or resized, its features can be easily reconfigured, rather than completely rebuilding the space. Because control rooms are built with modular wall panels, these units can be installed with little or no disruption to a company’s day-to-day operations. Also, employee efficiency may increase, as managers can more closely monitor workers and provide feedback. Similarly, safety is enhanced, as supervisors can easily keep tabs on individuals and the facility as a whole. Modular control rooms also allow for better air quality, as prefabricated buildings are generally built in a factory-controlled setting using dry materials, eliminating the possibility of high levels of moisture in the new construction. And since there are endless customization options available for modular control rooms, they can be crafted to meet all types of unique application needs. Most control rooms are tightly secured and not accessible to the public. This is especially true in military applications or in applications involving sensitive operations. Multiple electronic displays and control panels often are present, and some modular units even feature a wall-sized display area visible from every corner of the room. Modular control rooms are often fitted with sophisticated fire suppression and security systems; not only do these provide another layer of protection, they also help ensure operations can continue as required even in the event of an emergency. For that reason, modular control rooms typically come with an uninterruptible power supply and air conditioning system. Most use T-rated firestops — which are thick enough to keep heat from reaching the inside of the control room — and positive-pressure ventilation to prevent smoke or toxic gases from entering the room. At Speed Space, we offer a range of different modular structures for all types of industries and applications. 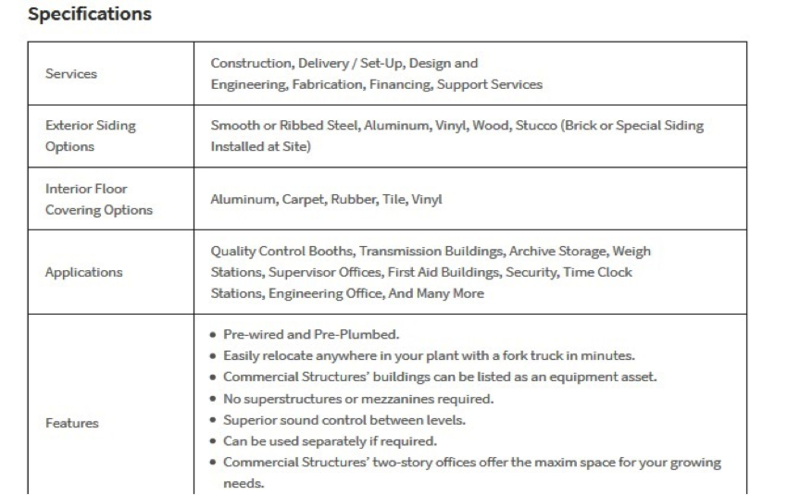 Below are the key specifications for our modular control rooms. Modular control rooms offer great versatility for a huge range of settings, enhancing safety and overall efficiency while allowing for optimal ease of construction and countless customization options. Here at Speed Space, we have over three decades of experience designing and installing modular buildings. To learn more about our modular product offerings or discuss options for your specific needs, request a quote from the team today.